2. Scroll to and touch Settings icon to proceed. 3. Scroll to and touch Lock screen under Personal options. 4. Touch Screen Lock to continue. 5. Touch to select Face Unlock from the list of unlock options. 6. Read the warning prompt and touch Next to continue. 7. Read the on-screen message and touch the Set it up button to proceed. 9. The next screen will show with a dotted circle. Hold the tablet so that your face appears inside the dotted circle. 10. Once your face has been captured, touch Continue. 11. The next screen will prompt you to create a backup unlock PIN or patter. In this guide, we'll use PIN in case Face Unlock cannot unlock the tablet. So touch PIN. 13. When you're done typing a PIN, touch Continue. 14. Re-type the PIN to confirm it. 16. Touch the button OK and you're all done. You've just set up Face Unlock on your new Samsung Galaxy Note 8 tablet. To unlock your tablet, just look at it. 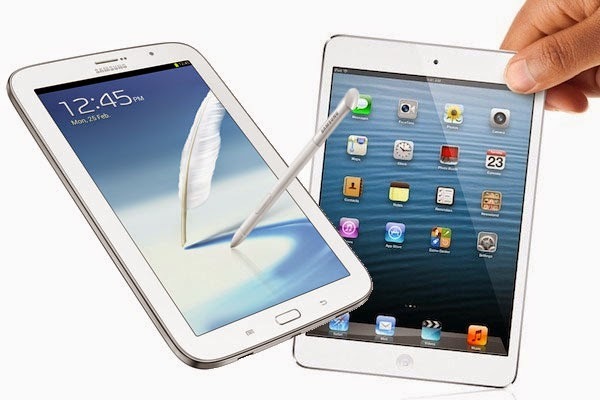 To unlock the tablet from standby mode, just hold it in front of your face and it should unlock. The new Samsung Galaxy Note 8 comes in different versions, including Samsung Galaxy Note 510, Samsung Galaxy Note 8 3G & WiFi, and Samsung Galaxy Note 8.0 LTE.